Sakoya Walker grew up in North Portland. She remembers the days when the Arco gas station at the corner of North Albina Avenue and Ainsworth Street was still open. She would swim at Peninsula Park and stop in at the am/pm for soft-serve ice cream. The gas station closed, and stood shuttered for years on a contaminated lot. In 1992, the Portland alumnae chapter of Delta Sigma Theta Sorority Inc., an international sisterhood of black college-educated women bought the site. Soon, the 1,500-square-foot service station, expanded to 2,700 square feet, will open as the June Key Delta Community Center. It’s the first African American-owned community building to pursue the Living Building Challenge – a Cascadia Green Building Council designation that requires projects to capture and reuse stormwater, achieve net zero energy consumption and include an urban agriculture component. Walker, who used to buy ice cream at the service station, was one of more than 40 apprentices with Oregon Tradeswomen Inc. who worked at the site. She helped hang the Sheetrock, did framing and built raised beds for the community garden. She was part of a group that gathered at the redeveloped brownfield site earlier this week for a formal announcement that the Environmental Protection Agency has awarded the City of Portland $1,400 000 in brownfields assessment and cleanup grants. Marveita Redding, pollution prevention services group manager at the Bureau of Environmental Services, said at the ceremony that $400,000 of the grant money is for site assessment and $1 million will go into an innovative revolving loan program that will be used for cleanup of brownfields. For more details on the grants, read Sophia Li’s story here. “We’re not only interested in cleaning up sites. We want to see them brought back to productive use,” said Redding before Andrew Colas, president of Colas Construction Inc., led a tour of the community center. He explained that 65 percent or more of the subcontractors who have worked on the project are emerging small businesses, or women- or minority-owned businesses. Minorities and the poor are sometimes excluded from the green economy because of a lack of training and experience in sustainable construction projects. He pointed out many green features: The center’s two bathrooms and kitchenette are repurposed steel cargo containers. Large glass windows, which turned out to be the wrong color for a project at the University of Washington, were diverted from the landfill, and the floors are made from recycled tires and asphalt. Construction should be complete in a few weeks. Marian Gilmore, outgoing president of the Portland chapter of Delta Sigma Theta, said that once the building opens it will be used for programs that promote educational and economic development, political awareness and physical and mental health in the community. Vera Pool, the sorority’s incoming president said that she is proud that so much of the construction work was done by women, many of them, African American. “It sets the standards for others,” she said. 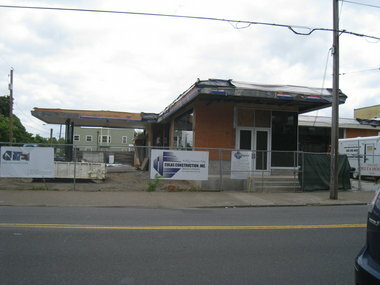 How does it feel now that this community center, so long in process, is finally nearing completion?